A delicious, nutritious dish with many variations to serve for lunch or dinner. 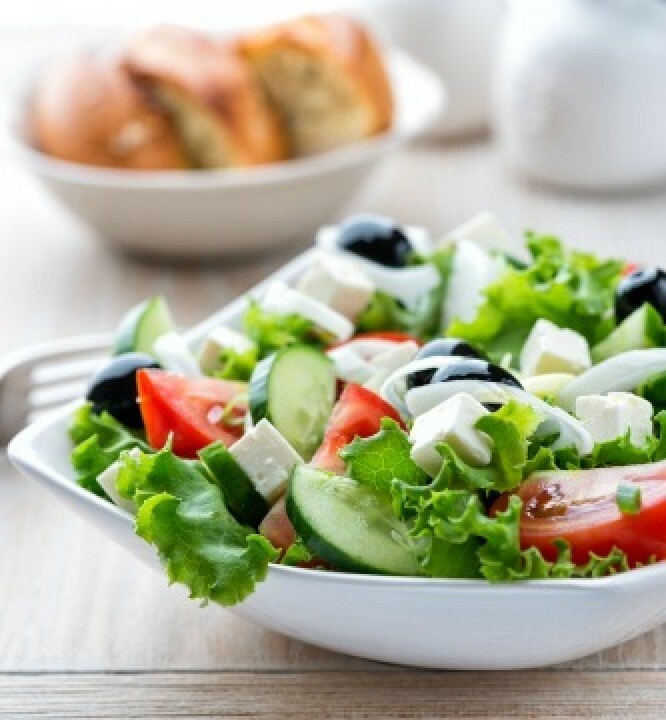 This page contains greek salad recipes. Toss first six ingredients in a large bowl. Lightly coat with olive oil and toss again. Splash with vinegar to your personal taste and toss again. Can serve immediately or, to allow flavors to blend, cover and refrigerate for two hours or even a day. Here's my twist on the original Brown Derby Cobb Salad. Besides the dressing ingredient mixture, the amount of the other ingredients are up to your mood of the day and the amount of people you are serving. Be sure to place the dressing (3/4 cup) in a cruet, so everyone can dress their salads to suit their own tastes. Any leftover dressing will store well in the refrigerator for about a week. Whisk together the olive oil and lemon juice, season to taste with salt and pepper, place in a cruet and set aside. Place the hearts of romaine on a serving platter. Arrange the cucumber, tomatoes, bell pepper, red onion, olives, peperoncini, and feta in strips on top of the romaine and serve. This healthy salad is perfect as a light lunch or would be a nice side salad. It is a great way to get your veggies in too! I made this dish for a get together with friends because they needed a vegetarian protein to go along with dinner. This dish was a hit with everyone! No leftovers. Put dressing ingredients in glass jar and shake to distribute. Drain cans of beans and rinse under cold water, let dry. I put them into the refrigerator to cool. Put one layer of beans and olives in casserole, drizzle with salad dressing and sprinkle with 1/4 of the feta cheese. Layer the remaining beans, olives and drizzle once more with dressing and sprinkle with the remaining cheese. Refrigerate until ready to serve. I used about half of the yield of Greek salad dressing in this dish and refrigerated the remainder. Personal preference. Tear lettuce and toss with cucumber, pepper, tomatoes, and scallions. Garnish with olives, anchovies, and cheese. Sprinkle with oregano, salt, and pepper. This is a great summer salad for picnics and potlucks. The cucumbers stay crisp longer than lettuce. Combine veggies in a large bowl or colander. Cover and place in fridge for a few hours or overnight. Pour off excess moisture or use a salad spinner. Add feta and dressing to taste and toss.